The Forget-Me-Not Project was launched a few years ago by a keen theatre-goer as part of a fund-raising initiative for Bloodwise (formerly known as Leukaemia & Lymphona Research). It is dedicated to the memory of my sister, Sue Pope (nee Beaumont) who died of Acute Myleoid Leukaemia at the age of 30. You can read more about Sue's story and the background to The Forget-Me-Not Project here. 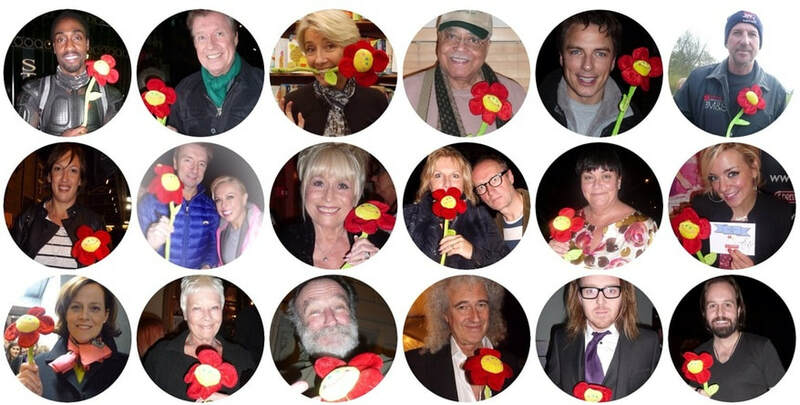 Among the many people who have participated so far are stars of stage & screen such as Dame Judi Dench, Sir Ian McKellen, Michael Ball, Robin Williams, Sarah Lancashire, Kiefer Sutherland, Alfie Boe, Stephen Fry, John Barrowman, Sir Ian Botham and many, many more.... The idea behind The Forget-Me-Not Project was originally inspired by a similar fundraising project centred around Broadway shows. Check out the How it works... page for more information. To date The Forget-Me-Not Project has been able to pass over £11,000 to Leukaemia & Lymphoma Research (now known as Bloodwise). Please help to increase this amount during 2019 by publicising / participating in our regular auctions. Thanks! Two months into the new year and, Strictly speaking, the Forget-Me-Not Project has a spring in its step...! I've been fortunate enough to meet several of the stars of Strictly Come Dancing at various shows this year, and many of them have generously provided photos & autographs which will be included in a bumper Summer Auction starting in early August. In the meantime I'm hoping to hold an interim auction in April featuring some exciting items gathered from last year's trip to Broadway. More to follow! It's hard to believe that 2019 marks my sister's 20th anniversary, but I am inspired to keep raising money in her memory for all those still involved in the battle against blood cancer. Thank you for your interest in / support of The Forget-Me-Not Project. GOING LIVE! 48 Christmas Auction listings begin today and will run through until Sunday 9th December, so for the chance to get hold of some unique / rare / highly collectible Christmas presents, why not get browsing and bidding? To see all of the items on offer check out the Current Auctions page or click HERE - and don't forget all proceeds go to support the sterling work of the UK's foremost blood cancer charity Bloodwise. With one week to go to the next Forget-Me-Not Project Auction, listings are currently being finalised and items are being added to the Current Auctions page daily. Among the autographs on offer are stars of stage, screen, music studio & dance floor such as Hugh Jackman, Sally Field, Jake Gyllenhaal, Orlando Bloom, Gary Barlow, Sian Gibson, Matt Cardle, Allison Janney, Laura Main, Eric Idle, Lea Salonga, Graham Norton, Oti Mabuse, Alfie Boe, Joe Lycett, Dame Eileen Atkins, Ben Fogle, Jenny McAlpine, Ian Waite and many more.... There are over 30 listings with all profits going to the brilliant Bloodwise charity. Please share & bid! My apologies that (due to a change in my personal circumstances) it wasn't possible to schedule an auction in the summer as planned. HOWEVER, I am delighted to announce that all of the items I have collected this year - and a few more - will be available to bid on between 29th November-9th December. More details to follow - watch this space....! 31st December 2017 - Happy New Year! I am delighted to say that the recent Christmas Auction has raised over £750 for Bloodwise which I will be passing on to the charity in the New Year. Huge thanks to all those who participated and also to all supporters of The Forget-Me-Not Project. Wishing you all a happy, healthy and prosperous 2018. Here's to an exciting year filled with more fun and fundraising! 12th December 2017 - Happy Christmas (bidding)! After an unforeseen period of inactivity due to major family/work commitments I'm delighted to say that The Forget-Me-Not Project is back with a special Christmas Auction running between 12th-19th December. The 37 auction listings include many items gathered during 2017 including signed Broadway Playbills, West End Theatre Programmes, unique photo/autograph sets and customised collectibles featuring famous names such as Jake Gyllenhaal, Bette Midler, Sally Field, Glenn Close, Mark Ruffalo, Patti LuPone, Allison Janney, Lea Salonga & many more! Visit the Current Auctions page for further details and links to each listing. Happy Christmas and happy bidding! As of today the amount donated to Bloodwise via The Forget--Me-Not Project has officially passed the £10,000 mark! I am thrilled and would like to say a huge thank you to all supporters and participants for your generosity of time, money & spirit. Plans for the forthcoming Summer Auction are in full swing and more details will be announced next month. Among the items included are a photo and autograph set featuring Mr Peter Kay (which was an absolute joy to obtain), lots of signed Playbills and programmes and hopefully a few surprises. This month marks my 50th birthday while August sees Sue's 18th anniversary; I couldnt wish for a better commemoration than to take the amount raised well into 5 figures. Please check back for updates and help to help the wonderful work of Bloodwise! 24th May 2017: a special auction, the year so far and the shape of things to come. Today I'm delighted to announce a one-off Forget-Me-Not Project auction for two tickets to a special Q&A with Peter Kay, Britain's favourite comedian and star of Phoenix Nights and Car Share, which takes place in Blackpool on Sunday 4th June. The seats are just 12 rows from the stage - a must for any Peter Kay fan! In this special event at the Blackpool Opera House the multi award-winning funny man will be discussing his phenomenal career in comedy and sharing some exclusive clips and outtakes from his most popular shows. The auction runs until Wednesday 31st May - you can place your bids HERE. Plans are also taking shape for further fundraising in the summer, including a bumper auction, an event in Torquay, a raffle and more sponsored activities - watch this space! In March I was able to raise just shy of £500 for Cancer Research by walking a minimum of 4 miles every single day in their 'March Against Cancer' Challenge. Thank you to all the generous folks who sponsored me! April saw a flying visit to New York to see the divine Miss Bette Midler in the sublime 'Hello, Dolly!' While there I was able to set about gathering some fantastic signed theatre memorabilia, including Playbills signed by Bette Midler herself, Jake Gyllenhaal, Sally Field, Glenn Close, Patti LuPone, Mark Ruffalo and many more - look out for them in the forthcoming Summer Auction. I hope there will be much more on offer in the coming months, so keep checking back and don't forget to follow the Forget-Me-Not Project on Facebook and Twitter. Thanks for supporting this little labour of love and helping Bloodwise to achieve big things in the fight against blood cancer. 2017 marks 2 personal milestones for me: as well as being the 18th anniversary of Sue's death, it's my 50th birthday this summer. So I'm looking to mark both these occasions by getting fitter and by raising a ton of money for various cancer charities. Please sponsor me in my first challenge here: My March Against Cancer. Also - if you get the chance - please go and see 'The Girls, the fantastic new musical written by Gary Barlow & Tim Firth based on the inspirational true story of 'The Calendar Girls' who have raised millions in the ongoing battle against leukaemia & other cancers. A brilliant cast, a brilliant cause and one of the funniest, most uplifting and feelgood musicals you could hope to see. Having seen it twice in previews I can't wait to go again. And it's raising tons of money and awareness, so what's not to love!?? And we're off! 50+ listings in aid of Bloodwise go live tonight: celebrity photo/autograph sets and dozens of signed items including playbills, programmes, posters, CD's and scripts. 100% of proceeds will be passed to the UK's leading leukaemia research charity. Please bid generously! Plans are finally afoot and the 2016 Forget-Me-Not Project Christmas Auction will launch on Sunday 20th November! Check out the Current Auctions page for a preview of the 50+ listings which include items featuring a host of West End, Broadway, Film & TV stars. To allow items to be posted in good time for Christmas, the Auction will end on Sunday 27th November so why not treat someone to a unique Xmas gift and give others the gift of life via the wonderful work undertaken by Bloodwise? That was the week that was! A few days ago I was able to pass the grand total of £1210.41 over to Bloodwise, all thanks to the generous bidders & buyers in the latest Forget-Me-Not Project auction. This means that - with your help - the Forget-Me-Not Project should be able to reach the memorable £10,000 mark this year, something I hope to achieve sooner rather than later. For starters, why not check out the current '2nd chance' auction where you can bid on 18 recent items which are still to find their 'forever homes'?! Visit the Current Auctions page for further details - but be quick; the listings end on 6th April. Thirty auction listings are now live and open for bidding - you can check them out on the Current Auctions page. Among the items are photos, autographs and an amazing VIP experience featuring stars of two of my favourite television programmes: Call the Midwife and The X Files. As always, 100% of proceeds from the auction will go to help Bloodwise in their ongoing battle to beat blood cancer. So why not treat yourself or a loved one to a unique gift and contribute to a fantastic cause to boot? Happy browsing/bidding! The date is set! The first Forget-Me-Not Project of 2016 will run between Thursday 17th March to Sunday 27th March and will feature a host of theatre, television and film stars including James Corden, David Suchet, Sheridan Smith, Tom Chambers, Julia McKenzie, James Earl Jones, Celia Imrie, Hugo Speer, Richard O'Brien, Jim Broadbent, Shane Richie, Emerald Fennell, Sheila Hancock and many more... Plus look out for a fantastic auction item featuring 'The X-Files' star David Duchovny. Welcome / welcome back to the Forget-Me-Not Project homepage! Unfortunately it's been a little while since my last auction but I hope to rectify that matter in the next few weeks, and to get the New Year off to a flying start. 2015 turned out to be a very challenging year for me both personally and professionally but, in the immortal words of D:REAM: 'Things Can Only Get Better'. So 'onwards & upwards' and other assorted clichés...! The year has started promisingly and I hope to include autographs and memorabilia featuring (amongst others) Jim Broadbent, Simon Russell Beale, Emerald Fennell, Sheridan Smith & Darius Campbell in the next auction. Stay tuned for details of where/what/when/how! In the meantime why not head over to the brand new Bloodwise website and check out all the exciting things which the charity has been involved in since its re-launch in September...? A quick update on the Forget-Me-Not Project so far this year: after the last auction a further £400 was passed to Leukaemia Research (an amount which I hope to double via a matched giving scheme). Things remain quiet on the theatre-going front - save for one glorious evening watching Emma Thompson & Bryn Terfel perform in the ENO's Sweeney Todd at the Coliseum - but I hope that normal service will be resumed as soon as my job search bears fruit. September 2015 will bring Blood Cancer Awareness month and the launch of a major campaign by LLRF, as was revealed at April's Impact Day. It was a day full of passionate advocacy, inspiring success stories and exciting developments which make me more determined than ever to carry on until blood cancer is finally beaten. Please help me do this by supporting The Forget-Me-Not Project via auctions and offline sales. The first Forget-Me-Not Project auction of 2015 begins tomorrow, featuring stars and memorabilia from my 3 most recently-seen shows: Forbidden Broadway, Assassins & City of Angels. Among the West End and Broadway stars who have contributed autographs and/or photographs are Aaron Tveit, Samantha Barks, Catherine Tate, Jamie Parker, Peter Polycarpou, Hadley Fraser, Rosalie Craig, Tam Mutu, Simon Lipkin and Christina Bianco. Check out the Current Auctions page between 19th-29th March for links to all listings. Nine weeks into the New Year (and only one West End trip so far!) but I'm happy to confirm that the first Forget-me-Not Project auction of 2015 will take place between 19th-29th March - watch this space for further details. I'm also looking forward to my 2nd theatre trip of the year in April, taking in the ENO's production of 'Sweeney Todd' and the West End transfer of the Young Vic's 'A View from the Bridge'. A further treat in April: my first visit to Leukaemia & Lymphoma Research's Impact Day where I hope to meet and connect with fellow fundraisers, volunteers, researchers and advocates. On a personal note, 2015 will see some major life changes for me, including redundancy from my (much-loved) job of 17 years. The year so far has been chock-full of travelling, training successors, replacing a bathroom & a kitchen, redecorating, re-writing my CV, searching for a new job and planning my financial future... among other things! When all the dust has settled I hope to resume regular auctions and introduce some exciting new fundraising ideas into The Forget-Me-Not Project... In the meantime thank you for bearing with! ﻿With just 4 days left to run in the Christmas Auction bidding is hotting up and The Forget-Me-Not Project is on course for its best-ever total. Huge thanks to all who have participated and publicised so far, especially Andy Jackson at Leukaemia & Lymphoma Research. Andy has kindly allowed me to write a blog page for the charity's website which you can view here. There are still plenty of items up for grabs, so if you fancy getting hold of a unique gift and helping a worthwhile cause into the bargain then why not visit our Current Auctions page...? And don't forget: all Forget-Me-Not celebrity flower photos can be purchased as reprints. Simply visit the Buy/Donate page for more information. Today's the day! Over 100 Christmas Auction listings will begin to go live from 2pm GMT. The auction runs through to Sunday 30th November and features an array of photos, books, programmes, playbills and other signed items which would make great gifts - or why not treat yourself?? Please help to support the vital work of Leukaemia & Lymphoma Research by sharing this link with friends, family and fellow fans... Many Thanks & Happy Bidding! Tonight's the night when 50 auction listings go live, featuring funny people such as Steve Coogan, Rufus Hound & Victoria Wood and fine actors such as Richard Armitage, John Lithgow & Mercedes Ruehl. Even as this auction gets underway plans are well in-hand for a bumper Christmas auction which will feature many highly-collectable items of signed-memorabilia along with several more unique flower photo/autograph sets. Look out for a Memorabilia page to be added to the site soon, showcasing all the signed items - sold & unsold - which have been collected for The Forget-Me-Not Project over the years. Many will feature in the bumper Christmas auction which is scheduled to start on 20th November. WELCOME to the new-look Forget-Me-Not Project website which is being launched in conjunction with our latest auction. Please use the menu above to navigate around the site. If you would like to go straight to our current listings please click HERE. September's auction runs from Thursday 18th until Sunday 28th and is dedicated to the memory of the late, great Robin Williams. The next auction will begin on Thursday 18th September and will run for 10 days. In honour of the late, great Robin Williams the auction will feature a host of comedians and comic actors as well as 3 of his former co-stars (John Lithgow from 'The World According to Garp', Mercedes Ruehl of 'The Fisher King' and Robert Sean Leonard of 'Dead Poets Society). By popular demand I will also be including a programme from the acclaimed Old Vic production of 'The Crucible' which has been signed by the entire cast including lead actor, Richard Armitage.